Violence in Kashmir Valley: 5 Dead in Protests After Terrorist Burhan Wani’s Killing : Today a fresh violence broke out in the valley of Kashmir as Muslim youth attacked security personnel, police post and BJP office at kulgam to protest the death of a terrorist Burhan Wani who belonged to Hijbul Mujhadin. The police officials said that 11 persons including 3 policemen injured in the violence. Muslim youths pelted stones at police post and police station in Bandipora, Qazigund and Larnoo in Anantnag district. The officials also said that Muslim youths also attacked on minority community who is guarding by the Indian Army in the area of Vessu of South Kashmir. They also attacked the BJP office in Nilo-Bugam area of Kulgam district and damaged the office building. The incidents of stone pelting were reported from Sheeri, Kreeri, Delina, Pattan and Palhalan area of North Kashmir’s Baramula District. 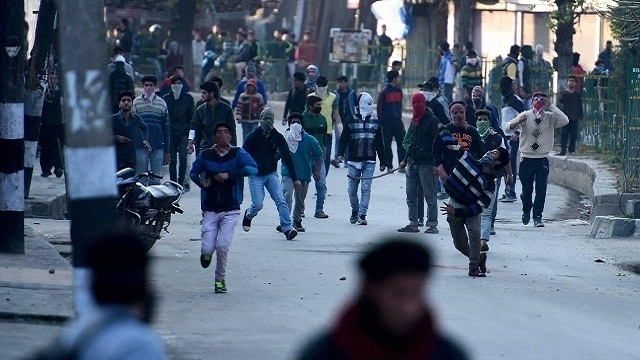 A violent protest also broke out in Barsoo and Shariefabad in Awantipora area of South Kashmir. Minor protests were also reported from several area of the city. Curfew imposed in the Kashmir valley especially in Srinagar city. Due to the protests in the valley, The holy Amarnath Yatra suspended for one day till now. Mobile Internet service were also suspended across the Kashmir and mobile telephoney services have been suspended in South Kashmir.